After being under the radar for a few weeks, Ethereum has regained the interest of the community. People say that any publicity is good publicity, and these words fit perfectly into the reality of this popular blockchain that grows day by day not only technologically but also socially. Within the technological area, one of the aspects that triggered a massive flow of interactions was the discussion regarding the much awaited Constantinople hard fork. The non-activation of the fork generated widespread speculation not only among developers but the community in general. Beyond this setback, another event that sparked much discussion was the debate between Nouriel Roubini and Vitalik Buterin. The arguments of each one served as support so that believers and skeptics could defend their ideas in social networks. In addition to this situation, there was considerable speculation about a possible real debate between the two. Another example of the growing interest in the development of Ethereum was the large number of new members joining the developer community. According to Github, Ethereum is the fifth-Fastest growing open source project in its entire database. For its part, the term “Cryptocurrency” is also one of the fastest growing topics in the developer community. In Reddit, Ethereum reached 400k of users, with a quite active and diverse community, ranging from expert developers to novice users who enter the world of crypto coins out of curiosity. 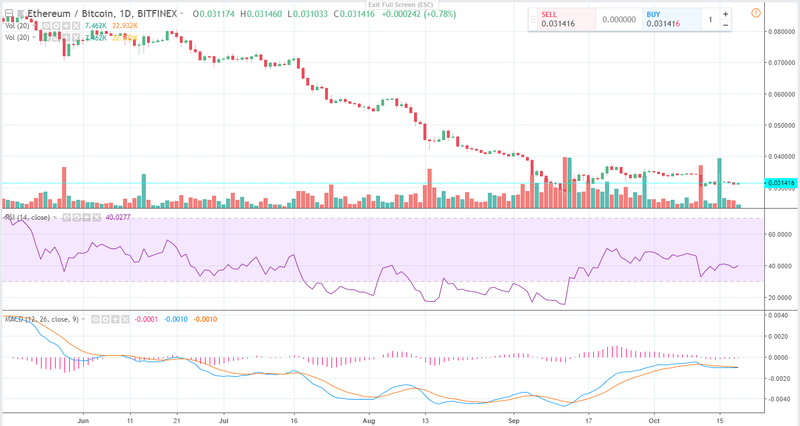 Currently, Ether (ETH) has not been able to recover from a sustained fall in its prices that has lasted several weeks, however during the last few days it has remained relatively stable in an area that could be described as strong support for technical analysists. This could mean that those who believe in this kind of signals could see the Ethereum as a call option. The RSI is quite low, and although the MACD has not given any definitive signals, it seems to be close to showing a possible reversal.